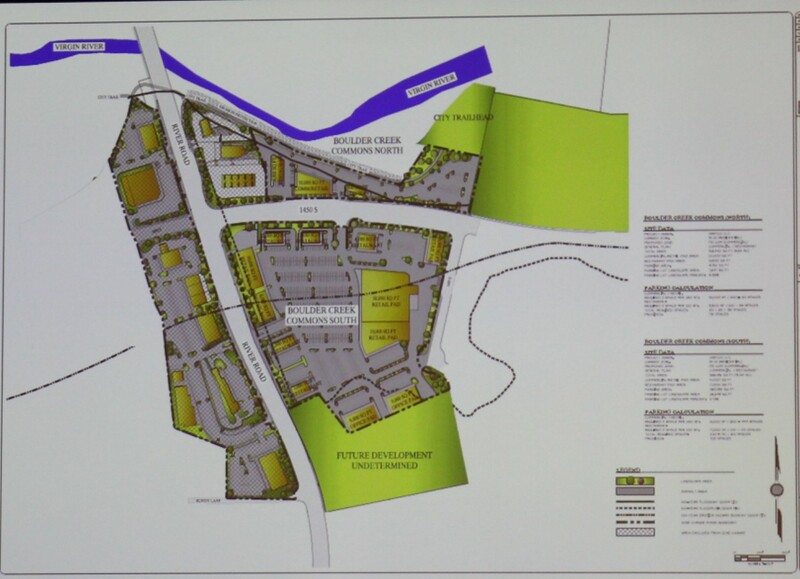 ST. GEORGE — The first meeting of the new year for the St. George City Council saw plans for a shopping center in the area of River Road and 1450 South Street move forward Thursday night as the council approved a zone change. As it develops and attracts commercial businesses of various types, the shopping center is anticipated to serve the growing population in the southeastern part of the city. Called Boulder Creek Commons, the planned commercial center covers more than 16 acres on the north and south side of 1450 South Street near River Road. The majority of the property, 13 acres, is located on the southern parcel, with the remaining 3.64 acres on the northern side of the road, just east of the Maverik convenience store and gas station and Jiffy Lube. Developers have proposed bringing a plethora of businesses into the commercial center, from a grocery store to retail outlets, office space and restaurants. Boulder Creek Crossing, which is being built on 35 acres situated along the western side of River Road across from Boulder Creek Commons, will also feature various types of businesses. According to information presented by the developers at the 2014 What’s Up Down South Economic Summit, the project is anticipated to produce as much as $60 million for the city and county and the region’s property tax base. Prior to the zone changes, the land the Boulder Creek Commons project sits on was zoned for residential development. Developers asked the city to approve a zone change to planned development zoning. City Manager Gary Esplin said this meant each individual building to be built on the property has to be reviewed and approved by city officials. 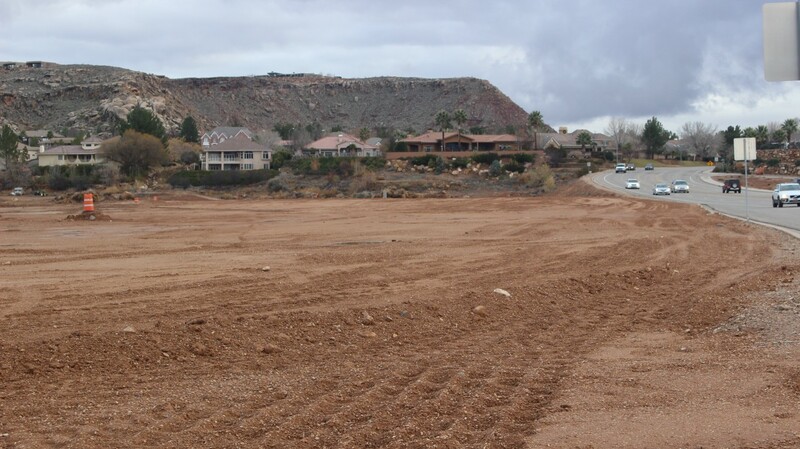 While residents living in the area appear largely in favor of the project, some expressed concerns about having a buffer between the commercial development and the homes in the Boulders neighborhood that sits atop the rim of the hill overlooking it. The southern part of the project does not yet reach up to the bottom of the hill, as it is separated by a roughly 6-acre parcel that remains under residential zoning. 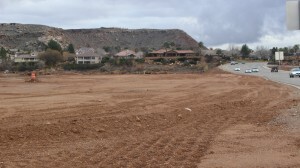 If the Boulder Creek Commons project does move to the bottom of the hill, a southeastern portion of it will also border the Boulder Springs Villas, a gated residential community that extents behind the Summit Athletic Club on 1450 South Street. “We want to see it remain residential,” area resident Hal Hickman said. 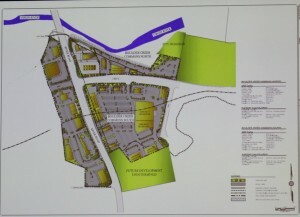 Suggestions of developing residential properties in the space between the planned commercial center and the hill were made, as was a request for a professional office building that could act as a buffer between the residential communities and the hustle and bustle created by the shopping center. Developer Mike Sheffield told the City Council and those in attendance his company hasn’t yet decided what to do with the 6-acre piece yet. A final decision may very well be determined by whatever the market demands. “We do not know what we’re doing with that yet,” Sheffield said. Whatever course is chosen in the future, developers will also have to work around a smaller parcel of land along River Road that is owned by someone else who as of yet hasn’t been willing to sell it. A concern was raised about how many drive-thru restaurants could be allowed on the southern parcel. Area resident Lorri Kocinski Puchlik asked the City Council not to allow that to be a permitted use on that piece of land due to worries over traffic impacts. The City Council ultimately voted to approve the zone change, though cut back some of the development on the southern parcel for the time being. They also restricted the number of drive-thru restaurants that could be on the southern parcel to three, though they noted the developer could still approach the city with a request to approve more. New City Councilman Ed Baca was welcomed to the City Council by Mayor Jon Pike and the other members of the City Council. 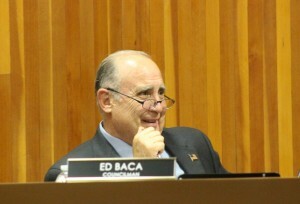 “It’s an honor and privilege to serve the people of St. George,” Baca said. A proclamation making January “Remembrance Month” in St. George was also signed by the mayor. The community is invited to attend a Remembrance Ceremony that will be held Jan. 25 at 6 p.m. at the Hughes Mortuary, 1027 E. 700 South in St. George. The event will feature a candlelight vigil and other activities related to remembering and honoring those who have passed on. Wooooohooooooo let’s get this thing going ! The area named Boulder Creek Commons North will flood. You heard it from Bender first. Upstream of a debris blocking bridge during a high water event. The unregulated Virgin River is a capricious and fickle mistress. She’ll come down on you like a ton of bricks. You knucklehead developers, landowners and politicians should leave this riverside property undeveloped. Had my eye on a property for sale on the southern ledge of this Commons development. With the possibility of no buffer and right to the hill? I think not now.